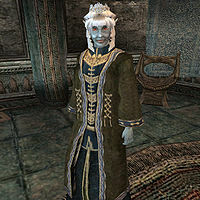 Barenziah was Queen of Wayrest and Queen Mother of Morrowind. She was born in Morrowind in 2E 893 and, over time, became a legendary figure across Tamriel. Barenziah was the wife of Symmachus and King Eadwyre of High Rock. With Symmachus, she was the mother of King Hlaalu Helseth (in 3E 376), who was to become King of Morrowind in 3E 425, and Morgiah (in 3E 384). She had a third child with a bard called Nightingale, who was widely believed to be Jagar Tharn, but was in fact master thief Drayven Indoril under his employ. The child, Dralsi, was left with a midwife and later reunited with her father. When she was very young, Barenziah also had a short love affair with Tiber Septim, and became pregnant. The emperor had the child aborted because he did not want to endanger his legitimate children's right to succession. During the beginning of Barenziah's negotiations in the Imperial City, Symmachus was slain by revolting peasants in Mournhold. During her time in the Imperial City, it was King Eadwyre who comforted her, and confirmed her suspicions about Jagar Tharn. In 3E 396, after revealing to Ria Silmane the final locations of the pieces of the Staff of Chaos, they fled across the Empire to the High Rock kingdom of Wayrest, now enemies of Tharn, but safe, as his efforts were focused on thwarting the Champion. Feeling that Mournhold was completely overrun by rebels, the Queen abdicated her throne of Morrowind, leaving it to her uncle Athyn Llethan, a House Hlaalu noble. She then married the elderly Eadwyre, became Queen of Wayrest, and played a role in bringing an end to the Imperial Simulacrum. She once again returned to Mournhold at the dusk of the Third Era, this time as Queen Mother, removed from the political spotlight. Her granddaughter, Karliah, daughter of Dralsi, played a part in the restoration of Riften's Thieves Guild in 4E 201. The Real Barenziah (Morrowind/Oblivion/Skyrim Version or Daggerfall Version). The Morrowind version is slightly censored compared to the Daggerfall version, but the Morrowind version is longer. This page was last modified on 21 October 2018, at 09:43.